Whether greenfield or brownfield, onshore or offshore, gas separation remains a complex but vital industrial process in the oil & gas value chain. Yet, three key challenges define gas separation today – safety, sustainability and economics. The issues of safety and sustainability are vital. There is a need to have lower emissions and chemical-free processes. A reduction in operator and personnel intervention and more automated processes will also alleviate HSE risk. The increase in the global demand for gas is also likely to see a rise in sour gas in future production with some operators expecting 40% of all future gas reserves to contain significant levels of H2S and CO2. To this end, the highest standards in production safety are required. gas separation projects. Often, dehydration with glycol – a liquid desiccant system – is used for the removal of water from natural gas. The impact H2S has on the degradation on glycols, however, can further increase HSE risks. The potential venting of toxic H2S, the contamination of the glycol regenerator, and high H2S gas inventories all provide significant safety challenges. Finally, there are the economics of gas separation and the need to reduce total cost of ownership and lifecycle costs to ensure that fields are commercially viable. This includes the need for lower capital and operating costs through to the production of higher volumes of gas and condensate, and reduced maintenance and installation costs. If offshore, savings can also be gained from the minimizing of the weight and footprint of gas separation facilities. So what technologies are addressing this long ‘laundry’ list of challenges facing gas separation today? 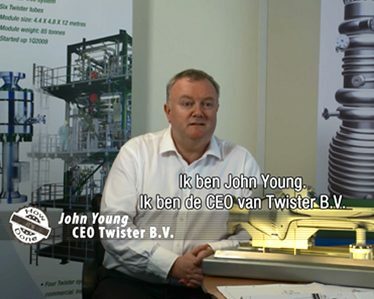 Many of the answers can be found with an engineering company based in the Netherlands called Twister B.V.
Twister delivers reliable, high-yield and robust solutions in natural gas processing and separation to the upstream and midstream oil and gas sectors. 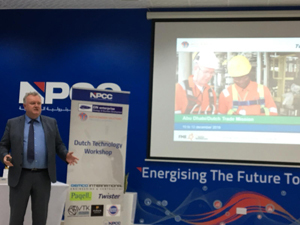 Having enjoyed impressive test results in the late 1990’s with an innovative air/water closed test loop for its separator concept, Twister quickly scaled up and gained operational experience on five onshore gas plants in the Netherlands, Nigeria and Norway. In addition to this, since 2003, there has been continuous successful full-scale commercial operation of Twister solutions on the PETRONAS/SSB B11 facility offshore East Malaysia. Today, Twister is a leading authority on fluid dynamics and separation processes with innovative gas separation technologies – the Twister Supersonic Separator; the Twister Hydrate Separator; the Twister SwirlValve; and the Twister SwirlSep. Twister’s knowledge of computational fluid dynamics (CFD), condensation kinetics and non-equilibrium thermodynamics has enabled the company to develop accurate predictive models of such products. These models are updated through rigorous testing in operational environments and through feedback from commercial operations. So does the Twister solutions portfolio meet the challenges previously outlined? All Twister solutions are reliable, low-maintenance alternatives to chemical-based technologies, providing safety, sustainability and economic benefits. This focus on safety and sustainability is achieved through compact and safe high-yield separation gas processing systems, a closedloop system and a reduced hydrocarbon inventory. The result is that personnel numbers can be brought down by as much as 50% and the inherent reliability of Twister’s solutions can reduce operator intervention by 75%. The Twister Supersonic Separator, for example, is a combination of known physical processes, aerodynamics, thermodynamics and fluid dynamics that produce a robust and compact gas conditioning process. When the Twister Supersonic Gas Technology is combined with the patented Twister Hydrate Separator – used to separate hydrates and liquids from natural gas without using chemicals – the result is low maintenance, a low sour hydrocarbon inventory and reduced equipment count. There is also no chemical degradation due to H2S, no emissions and very limited operator intervention. Furthermore, the fact that Twister’s supersonic gas solution dehydrates gas on the basis of expansion cooling instead of glycol absorption means that it is the safest way of dehydrating sour gas and does not face some of the safety issues outlined in the introduction. The Twister SwirlSep is another flagship solution that is a combination of the proven capabilities of the SwirlValve, a patented solution for improved performance over traditional JT-LTS solutions. swirling flow in the valve results in improved separation efficiency and the reduction of downstream separator size. Coupled with a compact inline separator results in the patented Twister SwirlSep that provides improved efficiency of separation at a fraction of the plot space and weight over the full range of flow rates. Unlike alternative solutions, the technology’s performance also does not deteriorate in turndown operations. that also makes the technology ideal for subsea applications. The SwirlSep initiative is being co-developed with our technology partner, the Frames Group. Twister’s high-yield and streamlined gas separation solutions are also proven to generate savings across the production lifecycle. production time – with up to 99% uptime – as well as savings from lower weight and smaller footprint designs, reduced installation and maintenance costs. The operating and platform capital costs can be reduced by up to 50%. In the case of the Twister Supersonic Separator, condensation and separation at supersonic velocity is the key to achieving a reduction in both total platform capital and operating costs. Other financial benefits include immediate start-up and flexible operations as new wells are introduced. For the Twister SwirlValve that improves the separation of two-phase flow across a pressure reduction valve such as a choke valve, JT valve or control valve, economic benefits include more flow throughput, increased gas handling capacity, a rise in natural gas production and the reduction in bottlenecks found in existing overloaded separators. interlinked), the result is improved economics across the project lifecycle and optimum natural gas recovery. platform in Malaysia with higher than normal sour gas contaminant levels. Here, Twister technology was a key element of the overall sour gas management risk mitigation strategy. As a closed system, the Twister Supersonic technology provided an inherently safer system over traditional dehydration solutions. An upgraded Twister Supersonic Separator technology was also selected for commercial application on Nigeria’s Okoloma gas plant with start up in 2009. In this case, Twister technology was selected due to its ability to achieve water and hydrocarbon dew-point specification without the need for a glycol plant, while also avoiding the need for a heat exchanger for inlet cooling. Separator tubes together with a chemical-free Twister Hydrate Separator. A second application is currently in construction for the SPDC TUNU plant. Twister systems are also installed by Petrobras in Brazil and by Ecopetrol in Colombia. So what of the future? Twister is partnering with Malaysian operator PETRONAS on the joint development of supersonic technology for CO2 separation. The Twister technology will be applied at PETRONAS’ first offshore cryogenic distillation facility located at the K5 field, a greenfield site situated 250 km offshore Sarawak. In October 2016, Dangote Industries Limited (DIL) of Nigeria completed the acquisition of Twister. A key rationale for the acquisition is that Twister’s gas processing technology will be fundamental to DIL’s strategy of unlocking up to 3 billion cubic feet per day (BCFD) of gas in order to meet Nigeria’s gas needs. Future applications for Twister also include subsea processing and fully unmanned offshore processing platforms. Operators today have a simple but demanding requirement when it comes to their gas separation activities. They are looking for safe, sustainable gas processing at a fraction of conventional lifecycle costs that can make their field developments commercially viable. Twister is achieving this through its’ ‘game changing’ technologies.